We are proud to announce a new partnership with a nonprofit that is near and dear to our hearts – the RI Special Olympics! We work with charities big and small across the country but are always excited to showcase organizations local to us in Rhode Island. The RI Special Olympics is a global organization that empowers people with intellectual disabilities. They boost confidence through the “power and joy of sport” and give individuals a chance to compete, achieve, and shine. 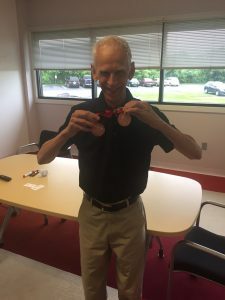 Frank shows off his RI Special Olympics medals for Track & Field and Softball! The RI Special Olympics offers over 1,600 opportunities in 19 sports over the course of the year! Athletes can train and compete in a variety of sports based on the season. Some of the sports include basketball, tennis, soccer, Alpine skiing, swimming, and sailing! There are currently over 4,000 athletes involved with the RI Special Olympics! We are lucky to have a RI Special Olympics Athlete as part of our very own team! Frank is a medalist in Track & Field and Softball, and we love to cheer him on at the Summer Games! If you want to support the RI Special Olympics, consider donating your vehicle. Car Donation Wizard is the name you can trust when it comes to your charity car donation. We return between 75-80% of the gross proceeds back to the charity, which is higher than any other car donation program. We are committed to supporting our charities day in and day out and believe in the work they do.